The Candystripes striker says competition for places is intense ahead of Sunday’s game at the Aviva Stadium. 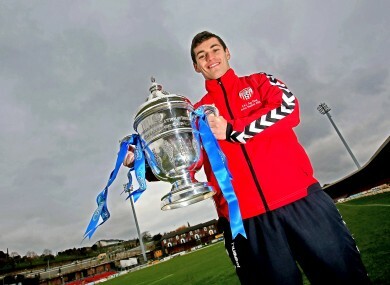 McDaid with the Ford FAI Cup last week. ON THE DAY Derry City last faced St Patrick’s Athletic in an FAI CUP final, David McDaid was celebrating for another reason. December 3, 2006 was his 16th birthday and on top of that, the promising young schoolboy had just signed for the Candystripes. Derry won 4-3 in the last game to be played at the old Lansdowne Road but only after 120 minutes of enthralling football in horrific conditions. Six years on and the 21-year-old is battling it out for a place in Sunday’s starting line-up. He has scored 18 goals in all competitions this season, including one in the semi-final replay win over Shelbourne, but is under no illusions and says the competition is stiff now Declan Devine has got a full-squad to choose from. “I can’t wait personally,” McDaid told TheScore last week. “Hopefully I keep my place in the starting XI, that’s the most important thing for me to be honest. When I get down to the Aviva, I don’t know what the feeling will be like but I’m sure it will be unbelievable. The competition has been intense over the last three weeks because everyone’s been back fit and other than a few guys playing with niggles, there is no one injured. No one will be guaranteed to start the final. While McDaid is pleased with how he has done in the 2012 campaign, he adds that, as a team, they have come up short of the high expectations they had going into the season. A cup win would go some way to making up for that disappointment, however. “For me, it’s been a really good season. It’s been successful enough on a personal level but for the team I suppose you could say we’ve had a up and down season. Rory Patterson, another player vying for a starting berth, adds: “Nobody’s as disappointed as us about how the league went. There has been factors. It’s probably been the worst team I’ve seen injury wise this year. “The number of injuries we’ve had this season has been a joke. We battles on and brought young lads in. It would be a nice way to end if we can go down and bring some silverware back. Everybody wants to be involved in the big games. I love a big game with a big crowd and atmosphere. Email “McDaid aiming for FAI Cup final starting role”. Feedback on “McDaid aiming for FAI Cup final starting role”.